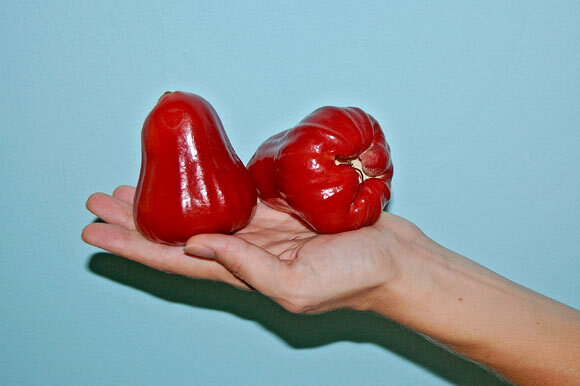 Rose apples. Think of a cross between a watermelon and an apple with all the flavor removed. 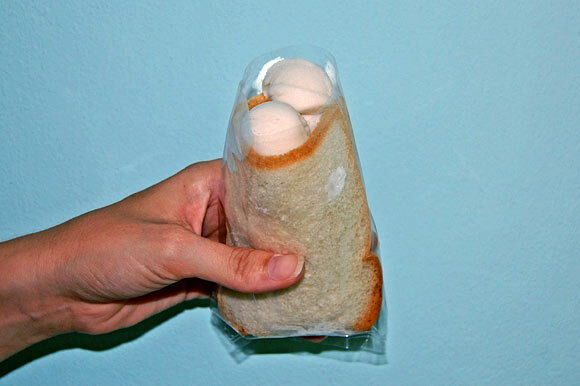 Coconut icecream served between slices of white bread. There are icecream vendors walking around the neighborhood all day long. Their push carts have little jingling bells. For 10bht(30¢), you can get a bunch of little scoops served either in a plastic cup or in the style pictured. Some vendors have sticky rice, sweetened condensed milk, and jelly toppings you can add to the desert. Thai icecream is a lot lighter and less creamy than back home, almost like sorbet. 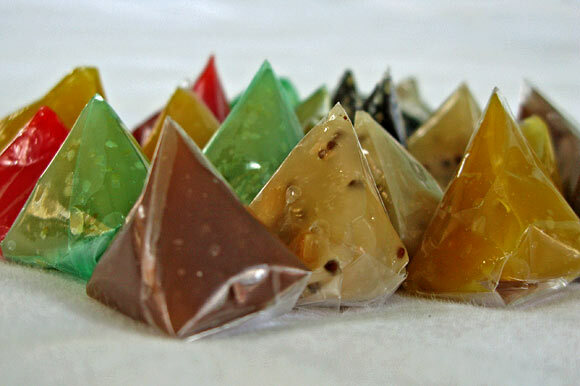 Thai jelly candies. 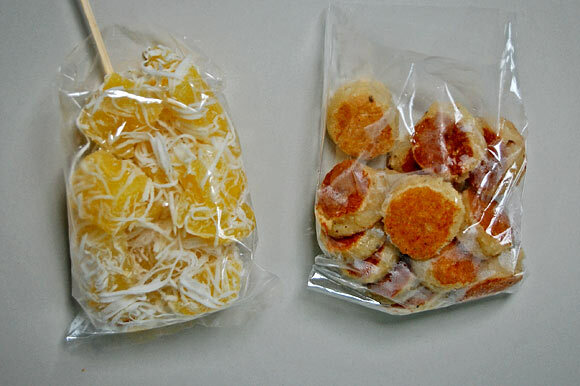 Chewy and semi-sweet, they come in a variety of flavors: coffee, durian, longan, strawberry, sesame, custard, more. We have been eating a lot of these for desert. Some contain pieces of nut or sesame seeds for enhanced texture. Small pepperoni and green olive pizza with a side of cheesy baked spinach. 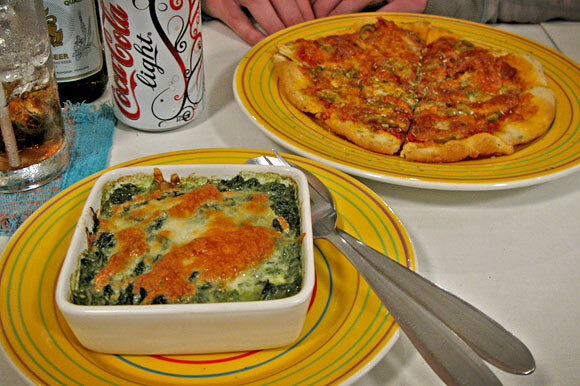 A good, but small and expensive meal from 8 Inch Pizza on Huay Kaew Road. 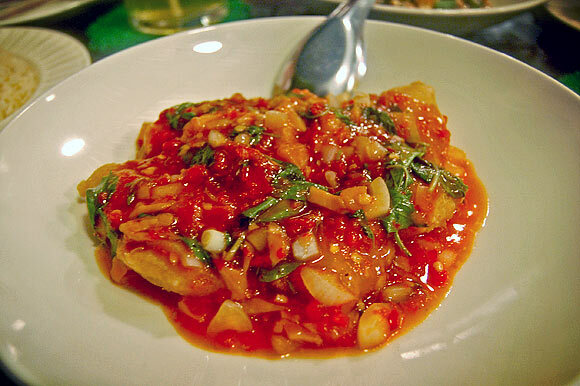 Batter-fried taro in a sweet chili garlic sauce. Looks like vomit, tastes like heaven. 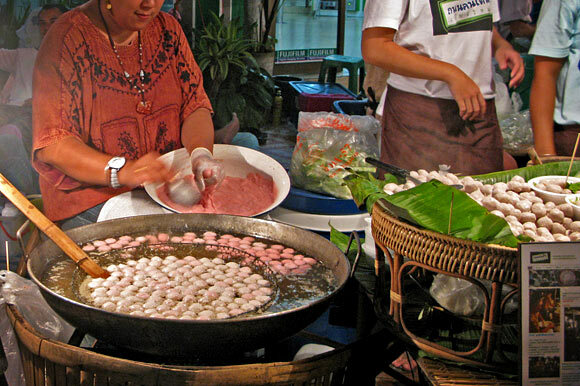 Fish balls getting formed and boiled in a large wok. 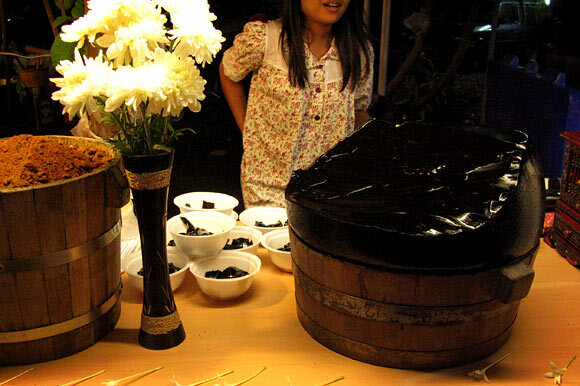 There are few better deserts than that made from a barrel of brown sugar and a barrel of black chinese grass jelly. 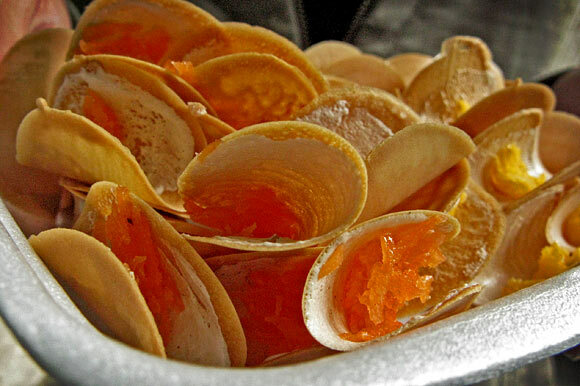 Shavings of the jelly are put in a bowl over crushed ice and sprinkled with sugar. Grass jelly has a delicious sweat and smoky flavor. Little folded cookies with different flavors of candied shredded coconut. Yesterday, we went out for boiled chicken and skewers and found a new favorite desert. They are small, thick cookies served hot off the grill. The dough is made with shredded coconut, rice flour, palm sugar, cooked rice, salt. Delicious. 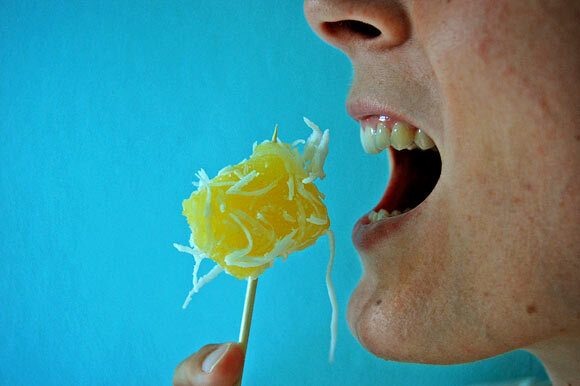 We also got a bag of globbed chewy yellow with shredded coconut on the outside. Sacks of chewy coconut globs and coconut cookies. This is how the globs are eaten. All of this eating reminded me I needed a teeth cleaning. I’ve been clenching my teeth at night again, I think due to being nervous about the upcoming India trip. So today I chased the storm clouds to a nearby Thai dentist called Grace Dental Care Clinic. They’ve gotten good marks in guidebooks and through word of mouth. I filled out a standard medical form, apologizing for having no form of ID. The office seemed to be entirely women, both patients and workers. In the waiting room, I feared that not only would I have conversations, but that I would start menstruating. I wasn’t sure what I would need should the time come, so I got out my day planner and Midol. Luckily, I was called to the examination room just in time. Men, FTW! The hygienist was friendly, and as expected, not fluent in English. Talking teeth with someone in a surgical mask with language issues gives it a vague, poetic quality. She remarked how nice my teet were for not having blaces. I kop kun krapped her. My teeth were violently cleaned of detritus using ultrasonic water and manual picks. She identified no new cavities and said everything was fine. Sounds good to me. I payed 1,200bht($35) for the visit. Expensive here, cheap back home. The guard in the parking lot under the building was asleep next to a dog when I pushed my bike into the street. I know Thailand is a beautiful country with lovely folks but who cares. I want to go there just to eat.